This picture shows the Gangtok city from a bird’s eye perspective. Gangtok looks like an artwork, as if someone has neatly splattered buildings over the mountains. We took this picture while returning from the Lingdong monastary from about a distance of 5 km. Of course, it was taken with a teleconversion lens mounted on our camera. Quite an eye catching view. 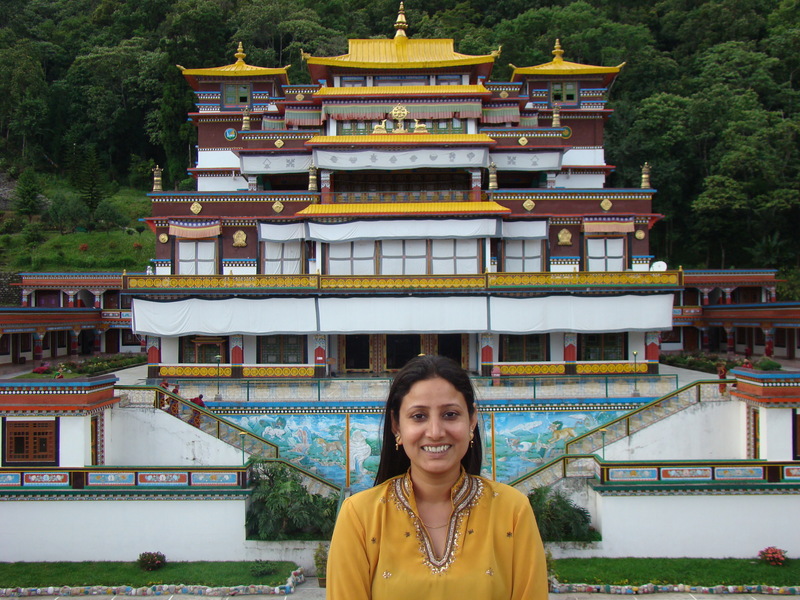 The Lingdong monastary is a beautiful place located in the Ranka village 5 km from the Rumtek, 20 km from Gangtok. This monastary is attached to a college of Tibetology. It is perched on a mountain slope away from the urban hush and is not frequented by tourists. Only monks are what you find here and you find yourself enveloped in serene tranquility of pristine nature. It has so calming effect on the body and soul that you may want to just sit there on it’s parapet walls and soak it in for eternity! The Rumtek Monastary is the oldest monastary in this region. The legend has it that there were heavenly signs including but not limited to lightening streak brilliantly white focussed on the point on ground supposed to be most pious. And the monastary was founded. It is the official seat of His Holiness Karmapa in exile. 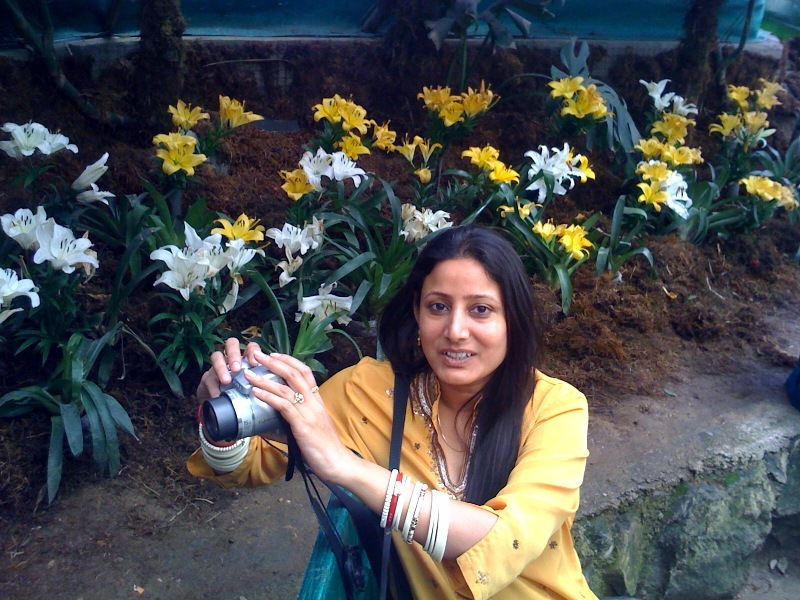 The first thing we did on our Gangtok full day excursion was to visit the flower show to pep up our mood. And refresh it did! The valleys in Sikkim are abound with magnificient flora during spring and early summer. By the end of May, we found the blooms scarce but for a few patches. However the flowers are just beautiful and we could never have enough watching those in their full glory. The morning began on a sombre note. Contrary to our expectations, it was not a brilliant day. It was cloudy and misty. And then as expected, our tour manager Gyatso informed us about the change in our itinerary. We will go for local sight-seeing today and Nathu La tomorrow. The permit was granted only for tomorrow. Moreover, the chopper rides were not available. The Sikkim tourism cancelled all the excursion flights and only Gangtok flight of 15 minutes was operating and that too was heavily booked for some VIPs who were around. So the helicopter ride is also out! So sad. We started our day with a visit to the flower exhibition to get back from the downtrodden mood! And it was of course refreshing. There were Hydrangeas and Neorolgeas and Petunias and Orchids in brilliant colours. These flowers are at bloom during the spring and early summer in Sikkim. By the time we were done with the flower show, Jaishree was back in the groove again. We moved on to the government handicrafts showrooms and then to Do-Drul Chorten in Deorali (near Gangtok). Here is a monastary and Institute of Tibetology. This monastary was a little different from the other monastaries with a rather smallish front-yard and larger dormitories. Perhaps the reason being its attachment to the institute. Lots of ‘diyas’ in one enclosure caught our eye. It was amazing to watch hundreds of ‘diyas’ arranged neatly on a table, some of which were burning! The museum of tibetology was also good. We got immersed in the exhibits and the photo-documentation of the history of Sikkim. Sikkim was merged with India in 1975 by the way. The photo-stories of the Chogyal rulers and the relations with the Druk (Bhutan) was absorbing. Photography was not allowed so we couldn’t capture some of those moments of Sikkimese history. We then took a cable-car ride and the sight of Gangtok and adjoining hills was simply mesmerizing. 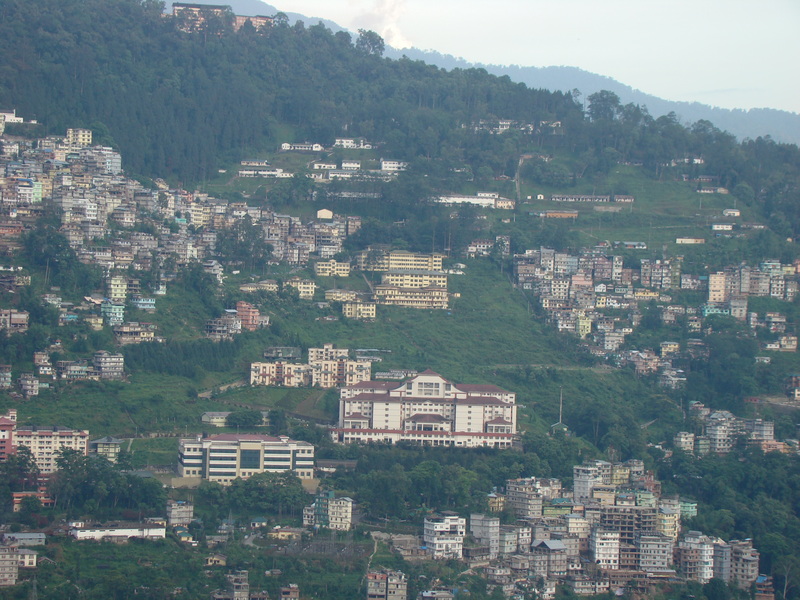 The multi-stories building were splattered across the hills to form the city called Gangtok. It looks like as if some school kid has done a 3D clay model with little boxes neatly strewn all over the hills! Without wasting more time we drove to Rumtek Monastary which is the oldest monastary in this region. It is 20 kilometres from Gangtok and the terrain is hilly. The Rumtek is guarded by the ITBPF (Indo Tibet Border Polic Force) and is frequested mostly by the tourists. The photography inside isn’t allowed and we had to content by being silent visitors to the main prayer hall. At that time prayer was on and the entire hall was resounding with chants of some 20-25 monks. The monsatary itself is not so beautiful and looks just like any other monastary. However, it is an important landmark, owing to it being the oldest monastary and also the seat of the Karmapa in exile, His holiness, the XVIth Gyawla Karmapa, the head of the Karma Kagyu order. From the Rumtek, we took a detour of 5-6 kilometres to not-so-frequented LingDong Monastary. The moment we reached this place, we went into another world! It is so quiet, serene, and tranquil that it just captivates your senses. Located on a remote hill in the Ranka village, it is surrounded by forest and the freshness here has a calming effect. 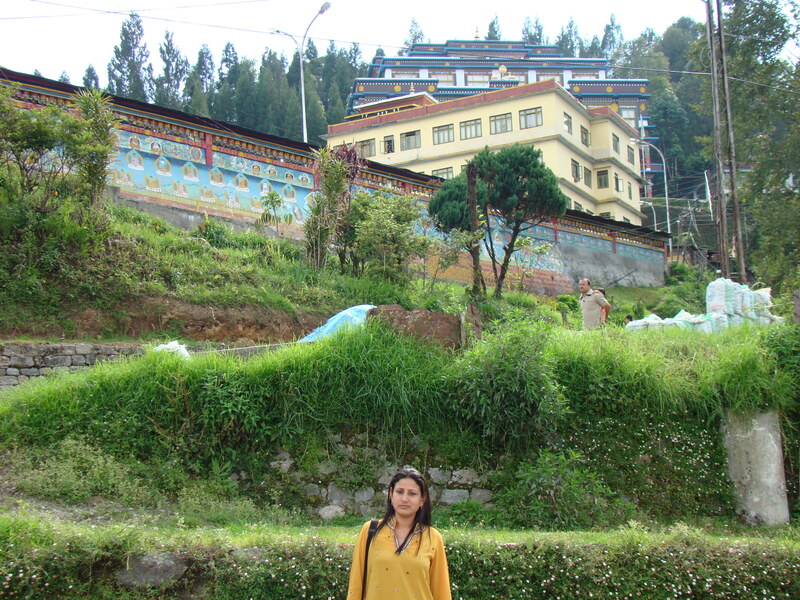 This is the best place we went to in and around Gangtok! Not many tourists come here as because it is not included in the 10-point tour which is offered to everyone coming here. Courtesy our cabbie, Karma we got a chance that we shall never regret. This monastary is attached to a college of Tibetology and hence there are numerous hostel rooms for monks that form the periphery of the central prayer hall. We were welcome in the prayer hall and incidentally the prayers were on here as well. We were allowed to do whatever we wanted to in the hall which is truly a great gesture on the part of the monks. Of course we preserved the sanctity of the place by not talking and not being animated! We photographed the breathtakingly beautiful prayer hall to our hearts desire. The hall is decorated tastefully in true tibetan style with colourful motifs all around. The LingDong Monastary is equally beautiful on its exteriors and we spent quite some time around there. Towards the end of the day, we stopped by the BanJhakri Waterfalls on the way back to Gangtok. It is a small but aesthetically developed park around a natural water fall. Jaishree found the place a delight before returning back to our boring hotel at Gangtok. MG Road Market, the main market place in Gangtok. When we reached to this place, it started raining. The market is paved with stone and looks awesome with peculiarly beautiful street lamps and flowers baskets hanging from those lamp posts. It was peak season and the market was crowded with tourists. Starkly different from other cities, Gangtok is composed of multi-storied buildings that are closely packed and strewn on the hills. 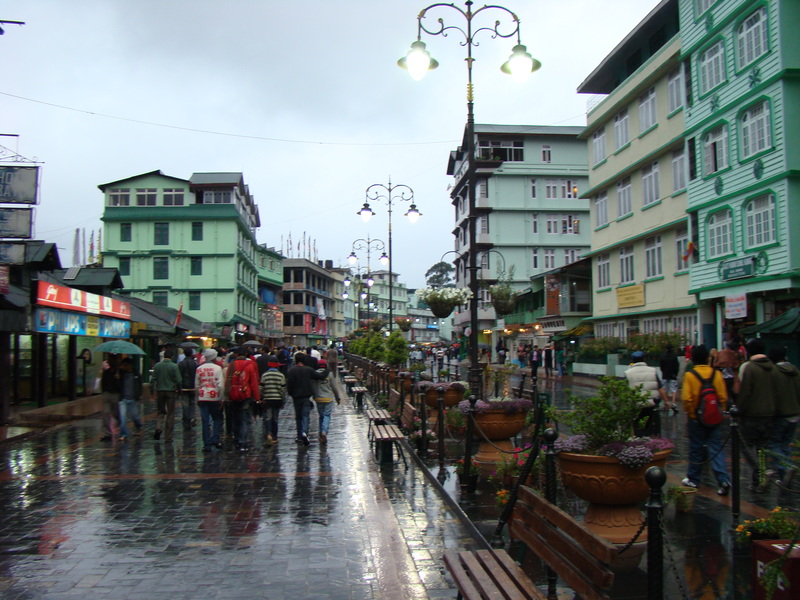 Another noticiable structure in Gangtok and other towns of Sikkim is the pedestrian walkway. Enclosed with green coloured railings, the footpath is on the left side of the roads and runs approximately 35 kilometres across Sikkim.